Collar stud escape and evasion compass. 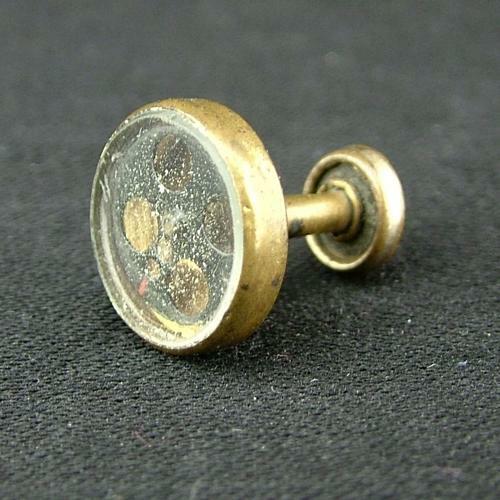 An ingenious method of hiding a compass inside a collar stud that would have been issued to some aircrew and worn with their RAF shirt/collar. Made using a cheap gilt metal collar stud into which an integral compass pivot and rotor were added. The glass top would have originally been painted white to hide the compass beneath but this has since been scraped off. Interesting to note that many of the studs used for this purpose were actually purchased from Woolworth. When 'downed' in enemy territory this could help the unfortunate airman back to safety. This example has a little dust under the glass but the rotor functions correctly and points North. A rare item. Stock code E23265.